Baseball is hard enough without an extended absence from competitive action. So it went for Connor Wong, who didn't play in a meaningful game for nearly six weeks after ending his career at the University of Houston. But after a slow start, the Dodgers' No. 26 prospect is starting to make up for lost time at the expense of opposing Midwest League pitchers. 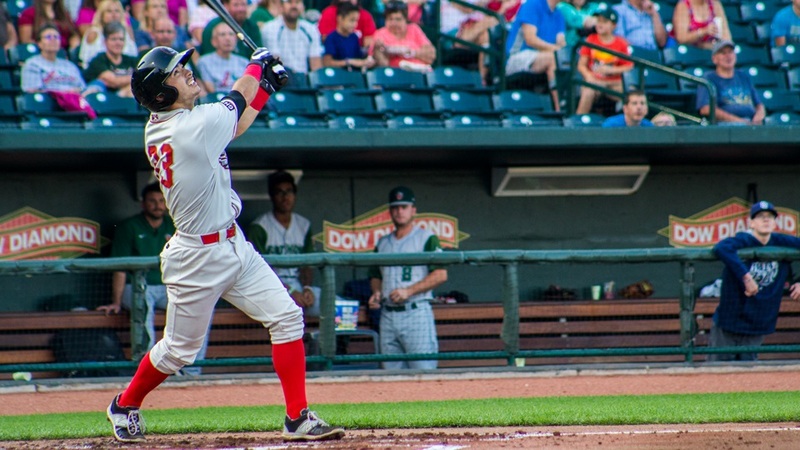 Wong homered for the second straight game and drove in a career-high four runs as Class A Great Lakes rolled past Fort Wayne, 10-1, on Saturday night at Parkview Field. For Wong, time away from the game had its benefits, but it also contributed heavily to his slow start. The 21-year-old batted .135 with one double and three RBIs in his first 14 games, but he's gone on an 8-for-14 tear with two homers, two doubles and 10 RBIs over his last three contests. That's raised his batting average to .227. "I'm up there looking for good pitches to hit," the Houston native said. "Hopefully I get some and then it's a matter of putting good swings on them. That's basically it. I struggled a bit early on with my timing, but I've found my groove recently and hopefully I can ride it as long as it lasts. "I feel fresh and I love going out there and playing. Getting an opportunity to play at this level is incredible. There isn't a bad day at the ballpark. I feel great. I'm going to continue working hard." Wong struck out looking to begin the second inning, but blasted a three-run shot to left field in the third to give the Loons a 4-1 lead. After striking out swinging in the fifth, the backstop stroked an RBI double to left and scored in the seventh before grounding out to second in the ninth. "Obviously, there's an adjustment period to go through. No matter how much you hit in the batting cage, it's not facing live pitching, especially at this level, where the depth of arms is so much stronger," Wong said. "In college at UH, you'd face certain pitchers who weren't as tough to hit against compared to the Friday-night starters. But these guys all seem to have good stuff, good command and they're here for a reason." Saige Jenco led off the game with a home run and Brock Carpenter also went deep for Great Lakes. Dodgers No. 4 prospect and 2017 first-round pick Jeren Kendall doubled, tripled and drove in two runs, while No. 9 prospect Gavin Lux had three hits, including a triple. Padres No. 4 prospect Fernando Tatis Jr. went 2-for-3 with two walks and No. 23 prospect Hudson Potts singled twice for Fort Wayne. Starter Michel Baez (5-2) struck out 11 over a season-low four innings for the Tin Caps. San Diego's seventh-ranked prospect allowed five runs on four hits and three walks. Michael Avallone is a contributor to MiLB.com. Follow him on Twitter @MavalloneMiLB This story was not subject to the approval of the National Association of Professional Baseball Leagues or its clubs.